Moltara City was the same bustling subterranean metropolis it had always been, thought Stealth, a brown Grundo. It was just another day for him. He woke up, panicked at his once-again-missed alarm, ran out of his apartment screaming, and while his arms flailed and his roommate covered his ears, he managed to get to the obsidian quarry on time against all odds, avoided causing any stirs at work, and collected his share of neopoints for a job well done. Pay day had been progressing as usual. While Stealth's roommate, best friend, and more responsible half, a Christmas Kacheek named Jacob, was more reclusive and did tinkering jobs out of their own apartment, Stealth was much more socially geared. In their apartment, that meant he was usually responsible for groceries and other such things. He didn't mind. After picking up some dinner at Molten Morsels, he headed back home...until he saw a storefront he hadn't seen before. The building's facade was adorned with a "Grand Opening" banner and sales were advertised across all window panes. The door read "Moltara City Card and Game Shop." Taken by curiosity, Stealth went inside. A cheery Quiggle bounced toward him. "Welcome, sir! How may I be of assistance?" "Just checking the place out for now," said Stealth. "Brand new store, huh?" "Oh yes," said the Quiggle. "Our previous locations in Neopia Central and Roo Island did well enough to allow for expansion." "Glad to hear it!" Stealth said as he browsed the store shelves. He had a small bonus this week, so he wanted to pick something up. Help the local economy while providing oneself entertainment? It was a win-win. "NeoQuest II has been popular recently," said the Quiggle in an attempt to help. "No thanks," Stealth said. "My roommate and I don't really have the time needed to enjoy that kind of game." An idea struck the amphibious clerk. "If it's a time issue, I can show you a game that's best played in short rounds. It's been sweeping Neopia lately. Come, follow me." Stealth followed the Quiggle to the counter, where he took out a box. Adorning the front was a logo that read "Dueling Decks" in a vibrant font. "A simple game, really! Each player draws a card, which features a Neopian hero or villain, and a stat is picked. The player with the higher of the two stats wins the round and takes control of the other's card. Play continues until one player has all of the cards, and is crowned the winner." "That sounds simple enough," said Stealth. "I really like the famous Neopian part." "Aye, it gives the game a lot of collectibility." "After all, each booster pack contains only a portion of the available heroes and villains. Collecting them all requires a lot of luck and patience." Stealth felt at odds with himself. He realized he might succumb to his desire to collect them all. But...a couple of packs wouldn't hurt, right? Stealth put some neopoints on the counter. "A wise choice," said the Quiggle, handing Stealth a pack of cards. Stealth tore open the packaging and took out the cards. Included were several Werther cards, a Gorix card, a Meerca Brothers card, and a Fyora card. "Oh wow, Fyora? And on your first try, too?" said the Quiggle. "She's one of the rarest in the game! You must have a gift." A gift, huh? Stealth began to think that, maybe, he was right. "Maybe I'll buy...a few more packs..." began Stealth. "...After all, I wouldn't want my roommate to not have any." Jacob had stepped out of the apartment to get a part he needed from Tangor, but was now returning home. "Hey Stealth, I hope everything was okay when I was gone. How was your...Stealth?" Stealth was sitting on the floor reading the gameplay instructions, completely engrossed in the game. "Is that a new game?" Jacob asked. "Oh, that game with the famous Neopians?" Jacob asked. "Yep!" Stealth began as he tore open his last pack. "Ugh...another Werther? More like worthless," he mumbled as he through the extra card off to the side. Jacob frowned and picked up the card, staring at it. "I'll have you know Werther is a valued member of the Seekers and an esteemed colleague of mine," he said. "Not to mention the dubiousness of using real pets as playing pieces, or the fact that it's essentially glorifying villainy in some cases. How much did this even cost?" "Only a few hundred thousand neopoints," Stealth said nonchalantly. The realization then hit him almost as hard as it hit Jacob. "Stealth, that's more than your entire last paycheck! What about the rent?" "I'll make it up. When's the rent due again? Next week? Week after? I'll just do some extra shifts." "The rent's due tomorrow, Stealth." All went silent for a moment as the realization hit. "I...I have some left in the bank," Stealth said. "Been saving for a rainy day." "We live underground..." Jacob muttered. "Regardless, I'll set this right, buddy." Stealth grabbed his bag and left the apartment, leaving Jacob behind to stare at a massive pile of extra trading cards. Stealth booked it down the gas lamp-lit road and made for the heart of Moltara City, where the Moltaran branch of the National Neopian made its home. From one bustling boulevard to the next, Stealth continued to run, antennae racing to catch up with the rest of him. Finally, he arrived at the bank. The teller gave him a smile on the way in. From the outside, no one could tell that from within, the turmoil Stealth experienced threatened to swallow him whole, and completely overtake him. Not unlike a Dueling Deck card with stats much higher than the opponent's, he thought. He shook his head, as if to expel the idea from his cranium. Jacob was counting on him. He took the neopoints and headed home, just enough for rent. And then Stealth saw a small sign outside a shop. "Oh wow!" Stealth said aloud. "That's enough to cover rent for the next year!" Stealth's eyes wandered over to a section he dreaded: the buy-in amount. Due to it being short notice, the amount of money needed to buy into the tournament was much higher...about as much as the rent money he had on him. Stealth wasn't sure what to do. He could, on one hand, further his hobby and also show Jacob that he looks out for him. After all, he'd be providing the rent incredibly far in advance if he should win. But that "if" was what made him hesitate. If he ended up losing the tournament, not only would he and Jacob be homeless, but Jacob would likely never want to see him again. Stealth sighed and read the fine print. "Free Dueling Decks booster pack with every sign up." Jacob had awoken on the couch. Quite the stir outside, he thought. Though Moltara City was, well, a city, it was much less densely populated than places like Neopia Central or Altador, but the commotion made it sound as though a comparably sized crowd was waiting in their subterranean streets. He shuffled his feet as he walked over to the kitchen and grabbed his coffee mug. Already filled and steaming hot, just how he liked it. Stealth must have gotten up early. Unusual, for his day off, Jacob thought. He sat and found a note on his desk. "Final Warning - Eviction Notice." Jacob hadn't even sipped his coffee but he was already wide awake. He read it to himself. It would appear that you have failed to pay the established sum of neopoints necessary to allow you to take up residence in this apartment. As such, you are required to leave the premises immediately should the neopoints not be paid to me by this evening. Normally this leeway is not acceptable, however, I have other obligations this afternoon, so please take this period of reprieve to either gather your funds or gather your things. Stealth burst into the room to be greeted by Jacob's tear-welled eyes and borderline convulsing body. "I know this looks bad, but I can explain," said Stealth. "I'm sure you can," Jacob choked out. "And frankly I'd love to hear it." "Okay, just...just don't get too mad...I entered the big Dueling Decks tournament in town today. I already made it past the qualifier, but I still have the actual tournament ahead of me. I'd really like you there to cheer me on." "Cheer you on?!" Jacob bellowed. "Cheer for what? The fact that you're about to put us out on the streets?" "Jacob. The grand prize is enough to make rent for the next year, with some left over. When I win..."
Stealth was taken aback. "You don't think I'll win?" "Despite whether or not I THINK you'll win, at least I recognize it isn't guaranteed. Our rent isn't something you use as a metaphorical poker chip." "Look, just...just trust me. I did some recon on the competition. Half of these guys are amateurs at best." "Didn't you just start playing yesterday?" "Yeah, but I'm a fast learner. And that's beside the point. I just...I want you there for moral support." "Well, I suppose. It's not like I have too much to pack, anyway...plus I could always get H.O.O.T. to pack for us while we're gone," he said, motioning to his petpet, an Albot. "You really have that little faith in me, huh?" "It's just precautionary, I assure you. I...I trust you, Stealth. Don't get me wrong, by all means, I really shouldn't...but I have faith. You really think the rest are all amateurs?" "Oh yeah, especially after what cards I got in that booster pack last night. But let's walk and talk, the next match is in a half an hour." Though that seemed like quite a bit of time, as Moltara City wasn't too expansive of a city, Jacob immediately saw what Stealth meant. Vendors and tourists lined the streets leaving not so much as a centimeter of free space. The on-foot traffic was the worst that either of them had ever seen. "You weren't kidding when you said this game was sweeping Neopia..." Jacob said, observing some younger pets playing a round of the game at a small cafe table while their parents played at another. "Well I mean, we DO live under several layers of rock, so you can't fault us too much for not knowing sooner," said Stealth. A gentleman Eyrie got up on a stage positioned in the center of the town square. He had Moltara's mustachioed mayor beside him. Evidently his speech must have been going on for quite a while, as it seemed he was at the end of a dedication. "And so, let the quarterfinals of the tournament begin!" He cut a rope. It wasn't as though the rope led to anywhere, but it was a symbolic thing, assumedly. "Good luck out there, Stealth," Jacob said, patting his friend on the shoulder. Stealth grabbed his deck and walked up to the other competitors to have his match. Jacob nervously twiddled his thumbs before he was lightly struck on the back. "Jacob? Fancy running into you here!" Before him was a purple Xweetok, wielding a pen and a notepad. "Leira Cross? I haven't seen you in about, well, fifty weeks, give or take!" Jacob said as he shook her paw. "The Neopian Times has me all over the place these days. I'd completely forgotten you live in Moltara City. Huge turnout, huh?" "I'll say. You'll be getting the scoop of the century here," he said with a chuckle. "I can see the headline now: 'Moltaran native brings home Dueling Decks trophy, pays rent.'" She laughed in return. "I think the fact that one of the best players in Neopia is competing might be a bigger draw. So are you just spectating?" "Yeah, my roommate is...wait a minute...one of the best players in Neopia?" Jacob asked. "Yep! Calls himself the King of Cards. Corny, I'll give you that, but it makes for great headlines." Jacob audibly gulped. "I sure hope you know what you're doing, Stealth..."
"Did you say somethings?" Stealth appeared next to Jacob. "Won that round in record time. The poor kid didn't know what happened." "Stealth, do you know who the 'King of Cards' is? Because he's here, competing." "I've only heard legends, but I didn't think he'd be here of all places..."
"Just focus, Stealth; you've got this. Believe in yourself." Stealth returned to the stage for the semifinals. He was facing a Skeith named Bronson from Roo Island. Jacob and Leira watched from the crowd as Stealth drew one card after another. The announcer was getting quite into the match as well. "And Stealth plays...oh, he's playing the Nightsteed! And Bronson's Vira is taken down!" "Playing Nightsteed that early on?" Leira asked. "As someone who has no idea how to play this game, care to elaborate?" Jacob asked. "I did some research beforehand, and basically every guidebook encourages players to save Nightsteed for later on. It's essentially a trump card...card." "Basically, yes. Though you'd know whether or not that's a good thing better than I." Jacob watched as Stealth somehow managed to correctly go with Intelligence over Charisma, letting his Lisha card defeat Bronson's Rufus card. "For now, I think it was a good thing." He smiled. Stealth drew another card and confidently played it. It was none other than Captain Tuan, whose stats far outdid the opponent's Gorix. Stealth had won his semifinal match, and the crowd roared in excitement. Stealth got up and shook Bronson's hand before taking a small bow, and then regrouped with Jacob in the interim. "You're doing great so far, Stealth! Just one more match and we're home free." "Not to bring your confidence down or anything," interrupted Leira, "but look at who he's facing." She pointed at the display board, which read "Grand Finals: Stealth vs The King of Cards." "Ladies and gentlemen," said the announcer, "let's bring out the one, the only, King of Cards!" A cloaked figure came out onto the stage, and once there, tore off the cloak, showing the visage of the King of Cards to the public for the first time. He was a slightly portly Peophin with a rather messy mane, yet an obviously well taken care of tail fin. "Stealth, is that..." Jacob started. "Our landlord?" Stealth said. "Yes, yes it is..."
"Well this day can't get any more convoluted than it already is, at least." Jacob placed a paw on his forehead. "Good luck, Stealth." He nudged his roommate to head back on stage. Leira couldn't help but laugh. "If your friend ends up winning this, it'll be the feel good piece of the year, you know that, right?" As Stealth prepared to sit at the playing table, so too did this "King." The judge explained that for the final round, he'd be picking the stat category from a predetermined, randomly generated list, to keep things fair. The two shook hands and rather awkwardly pretended not to know each other. The decks were shuffled and divided up, and the match began. Stealth started off strong, drawing Jacques right off the bat, which beat out Thaddeus' Meerca Brothers. All seemed to be going smoothly. Stealth and Thaddeus would then, somehow, manage to draw for the next few rounds, making the stakes incredibly high. Stealth smirked, however. Intelligence was the decided stat, and in his hand was one of the highest rated cards: Dr. Sloth. With added fervor, he threw the card of the would-be enslaver of Neopian kind onto the table and flashed a grin reminiscent of Sloth's own. Thaddeus chortled. He nonchalantly placed a card on the table...it was Roothless, not only one of the few cards to beat Sloth in Intelligence, but the highest rated card of that stat in the entire game. Thaddeus then scooped up the entire draw pile and both active cards and placed them on his side. "Of course Dr. Sloth would find a way to ruin my life while in card form too..." the disgruntled Grundo muttered. Thaddeus was in control of the game now, and Stealth had few cards left. He had to get back in the game somehow, and soon. Stealth breathed a sigh of relief as he drew a card. Nightsteed, just what he needed. Naturally, when up against Thaddeus' Lisha, Nightsteed was more than enough for Stealth to win. "Okay, just...focus," Stealth told himself. He was back in control. Things were good. He had this in the bag. Several moves passed and the cards remained favorable. Tuan, Jeran, Rufus...soon after, he was one card from winning. Stealth looked at his hand once more...his Fyora card. Perfect, he thought. He played it with confidence. "You shouldn't have done that," said Thaddeus. He then played, amazingly, a Nightsteed of his own, which beat out Stealth's Fyora. Not wanting to be beaten, Stealth looked at his hand...he had drawn his Werther card. Things weren't looking good. The judge called the category...Charisma. And wouldn't you know it, Werther beat out Dr. Sloth! Regaining his composure, Stealth heard the announced category and smiled. Intelligence. Thaddeus threw down Fyora, while Stealth threw down none other than the Roothless card he'd won from Thaddeus earlier. With that, Stealth took the Roothless and Fyora cards and stood up, surrounded by roaring applause. He got off the stage and was swarmed by press pets eager to get an interview. "Sorry everyone," he said. "This will be a Neopian Times exclusive," he finished, looking at Jacob and Leira. "Besides, I need to go make a payment really quickly." "Thanks for letting this be so...informal," Stealth said as he sat at the kitchen table and adjusted his slippers." "Not a problem at all," said Leira, taking a sip of coffee. Jacob entered, bearing a tray of biscuits. "Stealth, I can't thank you enough for pulling through," said Jacob. "No, don't. Honestly, I don't deserve thanks. I let this whole thing get the best of me...I'm just glad it turned out okay in the end. But I'll try to do better in the future." Stealth paused. "You can put that on record, actually." Leira began to jot it down. "So I guess my last question," said Leira, "is this: what are you gonna do now?" "We do have some leftover points after paying off rent for the year," said Stealth. "But I hear they're releasing another wave of Dueling Decks cards. Rumor has it Hanso, Brynn, King Kelpbeard, and the Tiki Tack Man are being added, among others." "Haha, relax," said Stealth. "Honestly I'm just gonna put it in the bank. Sorry if it's not the most exciting answer, Leira." Stealth chuckled to himself. "Enjoy the birthday gift idea though, Jacob," he said with a wink. The trio resumed eating their biscuits while Leira kept writing. "Moltaran local wins Dueling Decks tournament," the headline would read. All in all it worked out pretty well for them in the end. Leira got an exclusive interview with the tournament winner for the Neopian Times, Stealth regained Jacob's trust and saved their apartment, and Jacob could perhaps get more business with the influx of tourists this might bring to Moltara. Sure, it might have been luck, but maybe Stealth's victory was all in the cards after all. 749 issues of the Neopian Times have come and gone, and this petpet has seen them all. My favorite Neopian pastime is customising. 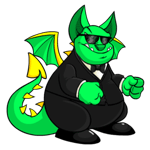 I love coming up with creative and different outfits that show off my Neopets' personalities. Therefore, in honor of Skeith Day, I set myself the task of transforming Skeiths into the spitting image of seven famous Skeiths. Do you want to help your Skeith celebrate in style?